Christopher P. Johnson is a college lecturer and co-founder/ head strength and conditioning coach at Boston Strength and Conditioning, llc in Newton, Ma. He received his Masters of Management degree as well as his Bachelors of Science Degree in Sports Science from Lasell College, and is currently pursuing a terminal degree through the Academy. This article is intended to provide young and new coaches with a comprehensive overview of existing research of a leadership development method for improving their leadership skills regardless of field. A broad range of existing literature related to leadership was compiled, examined, analyzed, and disseminated. The examined research findings suggest correlations between leaders of different fields can be made and used as advice for emerging leaders. Furthermore, existing research clearly supports a strong positive correlation between learning through experience and the art of followership as well as benefits of a method by which to teach these skills. A leadership development method serves as an excellent tool to further engage coaches desiring to improve their leadership knowledge and skills. By developing an understanding of the concepts identified and incorporating the practices prescribed within this essay, coaches may establish strategies that effectively expose them to the appropriate mentors and mentorships. Simply having the answers does not solve a problem. William Deresiewicz, Ph.D., author of several books and speeches regarding leadership believes there is a disconnect between how leadership is being taught and what constitutes leadership in a traditional sense. A fundamental aspect of teaching leadership that Dr. Deresiewicz believes is being overlooked is teaching people how to be thinkers (22). The ability to think and understand what the answers mean and how to employ them is key to successfully employing knowledge. By providing a universal leadership development framework using leadership development methods that this researcher has identified across research, it provides researchers with a method to think, learn, and apply the leadership characteristics uncovered in this study. After a detailed examination of literature concerning leader and team development strategies, learning through experience and the art of followership were considered significant. Dr. Stephen Butler (S. Butler, personal communication, 2016) mentioned during a phone conversation, he begins his first class during his leadership courses with “leadership cannot be taught, but it can be learned.” This researcher has identified two main elements of learning through experience, mimicking, and trial and error. Action is a main element of leadership and action is something that can only be learned through mimicking what is observed. As much as reading about an action such as leadership can prepare people for what is to come in theory, it does not allow for mistakes to be made and lessons learned. The actual experience of leading is the only thing that will improve leadership. When an individual is engaged in a real environment allowing him/her to observe leadership in real-time and make impacting leadership decisions, it allows him/her to create an image of leadership identity, manage perceptions, and develop his/her own leadership style modeled upon mentors and coaches. By operating in a hands-on real-time environment, it allows leaders to develop skills such as empathy and communication that can only be mastered through experience (14, 16, 29). Fast and Jensen (2006), studied the network of National Football League (NFL) coaches to determine what characterizes champion coaches. As the John Stumpf once said, “A’ people hire ‘A’ people, but ‘B’ People hire ‘C’ people; they’re concerned that that person might make them look bad.” Their findings suggested championship coaches were mentored by previous championship coaches. They also determined that championship coaches mentor fewer coaches than non-championship coaches. Furthermore, the most talented coaches stayed with a single mentor until they were promoted. This shows that success breeds success, having a single proven mentor is significantly more productive than multiple non-successful mentors. One of the ways people learn is by mimicking role models, otherwise known as the chameleon effect (6). When people are exposed to effective leadership traits, they learn how to cultivate those traits into a manner that works in their scenario. This appears to be what is occurring within the NFL network of coaches and is a significant aspect of learning through experience. New York Times bestselling author Robert Greene believes people today are steering away from the value of apprenticeships. People today want to be running the show after a few months without putting in the years of trial and error mimicking a mentor. Mastery is not something that manifests itself from nothing, it is the accumulation of years of training towards a passion (20). Simon Sinek mentioned something similar in an interview with Inside Quest, mentioning that the generation known as millennials by no fault of their own are over-accustomed to instant gratification. This is affecting their job satisfaction and strength of relationships. The achievements they desire take time and millennials are not always aware how much time mastery can take (28). Trial and error is another way in which people learn through experience (24). How are future leaders going to learn from their mistakes or how to deal with followers who disagree with their beliefs without hands on experience? Per leadership expert and the first professor of leadership John Adair (1973), leadership involves understanding three elements, the achievement of a goal or a task, the group of people performing the task, and each individual member of the group involved in the task. Leaders cannot learn the intrinsic attributes of people, how they work as a group, and what motivates them towards a goal without hands on experience. Although scenarios and case studies can be performed in a classroom, trial and error is where leaders learn to understand social differences. Followership is the infrastructure of teams. There is a heroic mindset often associated with leaders that they dictate orders and lead the way to victory for their servant and grateful followers. The dynamic process of leadership revolves around the art of followership and could not be further from the ‘heroic save the day’ leader mindset. In the military, commissioned and non-commissioned officers work hand in hand during all tasks. Although, a commissioned officer has higher rank than a non-commissioned officer, non-commissioned officers are one of the greatest sources of practical knowledge (30). Followers influence leaders as much as leaders influence followers. The two roles are symbiotic operating on a two-way street. Followers lead their leaders by providing a purpose for leaders to exist. In other words, if there were no followers, leaders would not have a purpose. Influence is a delicate force traded like currency between leaders and followers. Traditional thought crafts influence as a natural resource rather than a valuable commodity to be earned and used cautiously (8). The dynamic nature of influence is carved by the environment in which it takes place. With that said, the environment in which the leaders and followers operate affects influence as much as the individuals themselves and should be taken into equal consideration. Ruggieri (2013) examined variables such as fostering group cohesiveness and promoting efficacy in goal attainment when determining a leader’s level of influence. Ruggieri examined the transactional leadership model and the transformational leadership model to determine which model would produce the higher group cohesiveness and promote the greatest efficacy goal attainment. Results showed self-sacrifice as significant to leadership. The researcher determined that followers can relate to the leader’s self-sacrifice which increased team identification between the leader and followers. It was also noted that leader’s attitudes and behaviors are essential to maximizing their effectiveness. Followership is only as effective as its composing relationships, positive mental models, cohesion, and collective efficacy. Johnson-Laird (1983) described mental models as sets of beliefs about the world. People rely on their mental models to create new ideas (32). Positive mental models are a valuable piece of followership as they illustrate how an individual perceives his/her impact on team performance (4). Establishing positive mental models improves an individual’s internal environment. This in return improves his/her positive environment, which enhances the team experience. Cohesion is the glue in followership and is strengthened in two ways. First is through open vertical and horizontal communication channels between leaders and followers as well as followers and leaders, which encourage cohesion and create a positive environment of acceptance. Creating an accepting culture allows group integration-task and group integration-social activities to improve (17). By improving group integration-task and group integration-social activities, it allows group members to increase shared meaning. Shared meaning is essential to articulating shared meaning context and common language, which is necessary to make sense of each other’s actions and allow group members to work together more effectively (5). Positive environments are also essential to leadership development because they cultivate deliberate and controlled actions to be taken rather than automatic and instinctive actions. Positive environments are less stressful and leaders make clear and thought-out decisions in these environments. As stress rises, automatic and instinctive decision-making processes take over. This is an issue for leaders because it causes them to make decisions based upon previous experience, which may no longer be applicable (31). People desire patterns and rhythms, when they are stressed they seek familiar patterns and rhythms as shortcuts. Leaders have used them throughout evolution to aid with connecting the dots. Sometimes what they see is there and sometimes it is not (26). Additionally, positive environments allow leaders to enter discovery mode rather than defensive mode. Discovery mode occurs when leaders are allowed their space and are free from judgment. Once people feel threatened they enter defensive mode. A well-meaning act such as judgment makes someone feel unsafe and sends him/her into defensive mode, which can inhibit their ability to effectively lead (31). Challenge is the second aspect of cohesion. Challenge is a force, pulling people together like gravity. Gibbons and Ebbeck (2011), when replicating an earlier study, discovered that team building physical challenges provided beneficial self-conception outcomes for students. Additionally, when a challenge activity was used to increase team building by Shiperd et al. (2014), it was found to provide an effective technique to utilize in performing together and allowed teams to utilize innovative designs to their problems. Challenge activities provide leaders with an opportunity for teammates to discover each other’s strengths and weaknesses as well as who should be responsible for what role and who works best together. Leaders who stimulated a brief strategy discussion prior to starting performance showed better outcomes than leaders who did not allow their teams to hold a brief strategy discussion prior to engaging in challenge (9). Bonding periods such as this create experience as teammates, which improves interconnectedness, coordination, shared knowledge, mental models, and collective-efficacy (4, 12). Bandura ( 1997) defined Collective-efficacy as, “a group’s shared belief in its conjoint capabilities to organize and execute the courses of action required to produce given levels of attainments” (p. 477). It is a group’s shared goals and collaborative decision making that encourage collective efficacy (21). Challenges as mentioned above, are an excellent tool for improving collective efficacy within a team. By operating in a collaborative environment towards a fixed objective, team members must come together to solve problems. The better the team is at making decisions as a group towards their challenge goal, the more effective they are as a team (8, 9, 16, 17, 23, 27, 29, 31). Table 2.1 lists traits associated with learning through experience and the art of followership. 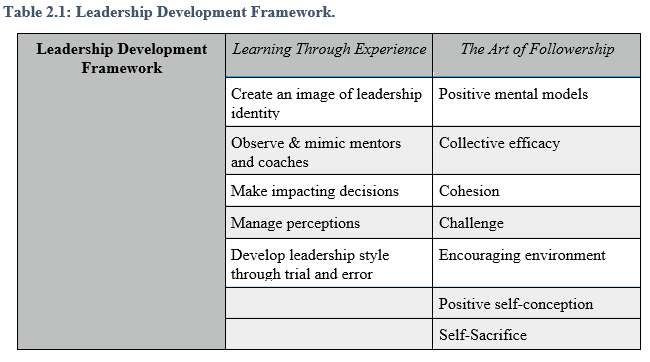 These elements of leadership development are suggested areas of focus when developing leaders. It is important to note that ‘learning through experience’ involves aspects of followership, but is concerned specifically with learning by doing, whereas ‘the art of followership’ can include any teaching and learning method the mentor deems beneficial to the mentoree, including but not limited to written work, reading, performing, shadowing, and observing. Research has indicated that well-planned leadership development strategies are a factor in inspiring individuals towards success (2, 10, 19). As such, interventions aimed at improving development should take into account a universal leadership development method such as the one described above with research backed findings across an array of disciplines published in reputable professional journals as acceptable methods of coaching athletes. Existing research related to leadership methods of developing leadership was extensively examined. Research findings published in reputable professional journals served as the primary sources for gathering information. Research findings were then analyzed, conclusions were formulated, and suggestions for the application of methods associated with developing a universal leadership method were spread. Several articles on the concept of learning through experience have shown to be effective at building leadership (1, 11, 14, 16, 22, 24, 29). The benefit appears to be due to mimicking (6, 20, 28), as well as trial and error (1, 24). The acts of mimicking and trial and error allow the student leader to create an image of leadership identity, manage perceptions, and develop his/her own leadership style modeled upon successful mentors and coaches. Followerships are a significant part of mastery. The arts and sciences have been using followerships as a means for young apprentices to improve their knowledge and skills craft for generations (2, 18). Followerships have been shown to only be as effective as their composing relationships, positive mental models, cohesion, and collective efficacy (3, 4, 5, 8, 9, 12, 15, 16, 17, 21, 23, 25, 26, 27, 29, 31, 32). Learning through experience has been justified in leadership development (1, 11, 14, 16, 22, 24, 29). First examining mimicking (6, 20, 28). Second, examining the trial and error (1, 24). Learning through experience utilizes mimicking as well as trial and error as a means of discovering what to do and what not to do as a leader. When we learn by mimicking successful leaders we aspire to emulate, and learning from our mistakes along the way, it has the tendency to stick better than simply reading it in a book. Leaders will only excel if they have other leaders to first follow. It has been said that leaders must also be good followers. For this reason, leaders have been grasping the traits of their craft for generations by acquiring a mentor and learning what to and not to do from that mentor. In recent years, a desire to rush the mentorship process has been observed and by acknowledging this trend, we as influencers of effective leadership development can re-engage new leaders in mentorships. Beginning their leadership journey by observing and acquiring more responsibility as their mentor deems appropriate. The real question that needs to be asked is, where do young leaders find mentors? By knowing where to get a mentor, aspiring leaders can start their leadership journey at an earlier age and go through it with more confidence. By having specifics to focus upon and accomplish during a leadership development program it helps teachers of leadership focus on a methodical system of improving future leaders. The students of today are tomorrow’s leaders. An effective leader is one who has risen up the ranks both academically and with hands on experience. To do so, leaders need to join a mentorship with an effective leader they admire and, in the beginning, observe that mentor, increasing their hands-on involvement as they progress through their career. How this leadership development process is performed is at the discretion of the mentor, but special attention should be placed on a positive and nurturing environment where the mentor is “in the trenches” working alongside their mentoree so the mentoree can observe and mimic their mentor’s style as they create their own leadership identity. Effective leaders are leaders who have matured throughout the years into the leadership style that best suits them, their followers, and their environment. Knowing this, cultivating a universal leadership development method for young coaches to enhance their knowledge and improve their skills is beneficial for sports. By implementing guidelines regarding what coaches should expect from a mentorship, it gives coaches the guidance they need to choose the most appropriate mentor for them. This is especially true for new or young coaches lacking experience but also holds true for experienced veteran coaches who understand we all constantly need to improve or risk becoming irrelevant. Leadership is an underlying aspect of coaching just as important as knowing the skills of the sport. Many times, we have seen amazing athletes turn out to be poor coaches and effective leadership skill is a main reason why these coaches lack the ability to share their knowledge and skills. A universal leadership development method shows these coaches how to learn the skills they need to properly disseminate their experience. 1. Adair, J. E. (1973). Action centered leadership. London, England: McGraw-Hill. 2. Avolio, B. J., Gardner, W. L. (2005). Authentic leadership development: Getting to the root of positive forms of leadership. The Leadership Quarterly, 16(3), 315-338. 3. Bandura, A. (1997). Self-efficacy: The exercise of control. New York: W. H. Freeman. 4. Boies, K., Howell, J. M. (2009). Leading military teams to think and feel: Exploring the relationship between leadership, soldiers’ cognitive and affective process, and team effectiveness. Military Psychology, 21(2), 216-232. 5. Bjorn, P., & Ngwenyama, O. (2008). Virtual team collaboration: building shared meaning, resolving breakdowns and creating translucence. Information Systems Journal, 19(3), 225-339. 6. Chartrand, T. L., & Bargh, J. A. (1999). The chameleon effect: The perception-behavior link and social interaction. Journal of Personality and Social Psychology, 76(6), 893-910. 8. Collinson, D., & Tourish, D. (2015). Teaching leadership critically: New directions for leadership pedagogy. Academy of Management Learning & Education, 14(4), 576-594. 9. Dalenberg, S., Vogelaar, A. L. W., & Beersma, B. (2009). The effect of a team strategy discussion on military team performance. Military Psychology, 2, 31-46. 10. Darling-Hammond, L., LaPointe, M., Meyerson, D., Orr. M. T., & Cohen, C. (2007). Preparing School Leaders for a Changing World: Lessons from Exemplary Leadership Development Programs. Stanford, CA: Stanford University, Stanford Educational Leadership Institute. 12. Filho, E., Tenenbaum, G., & Yang, Y. (2015). Cohesion, team mental models, and collective efficacy: Towards an integrated framework of team dynamics in sport. Journal of Sports Sciences, 33(6), 641. 13. Gibbons, S. L., & Ebbeck, V. (2011). Team building through physical challenges in gender-segregated classes and student self-conceptions. Journal of Experimental Education,34(1), 71-86. 15. Johnson-Laird, P. N. (1983). Mental models: Towards a cognitive science of language, inference, and consciousness 6. Cambridge, MA: Harvard University Press. 16. Jonathan, D. P. (2003). Can leadership be taught? Perspectives from management educators. ACAD MANAG LEARN EDU. 2(1), 54-67. 17. Kim, S., Magnusen, M., & Andrew, D. P. S. (2016). Divided we fall: Examining the relationship between horizontal team communication and team commitment via team cohesion. International Journal of Sports Science & Coaching, 11(5), 625. 18. Latour, S. M., Rast, V. J. (2003). Dynamic Followership the Perquisite for Effective Leadership. Air & Space Power Journal. 21. Maddux, J. E. (2002). Self-efficacy: The power of believing you can. In C. R. Snyder & S. Lopez (Eds), Handbook of positive psychology (pp. 257–276). Oxford, UK: Oxford University Press. 23. Morath, R. A., Leonard, A. L., & Zaccaro, S. J. (2011). Military leadership: An overview and introduction to the special issue. Military Psychology, 23(5), 453-461. 24. Nicolosi, G., & Peng, L. (2008). Do individual investors learn from their trading experience? Journal of Financial Markets, 12(2), 317-336. 25. Ruggieri, S. (2013). Leadership style, self-sacrifice, and team identification. Social Behavior and Personality, 41(7). 27. Shiperd, A. M., Basevitch, I., Renner, K. B., & Siwatu, K. O. (2014). Development and evaluation of a team building intervention with a U.S. collegiate rugby team: A mixed methods approach. Journal of Multidisciplinary Research, 6(2), 31-48. 29. Tillman, B. (2015). ‘The big e’ leadership factory. Naval History, 29(4), 16-21. 30. The Officer/ NCO Relationship. (1997). Department of The Army. 31. Webb, C. (2016). How small shifts in leadership can transform your team dynamic. McKinsey Quarterly, 2, 74-81. 32. Xiang, W., Sun, L., Chen, S., Yang, Z., & Liu, Z. (2015). The role of mental models in collaborative sketching. International Journal of Technology & Design Education, 25(1), 121-136.